Show Recap – Life of a Salesman with Coldwell Banker President Clark Toole! 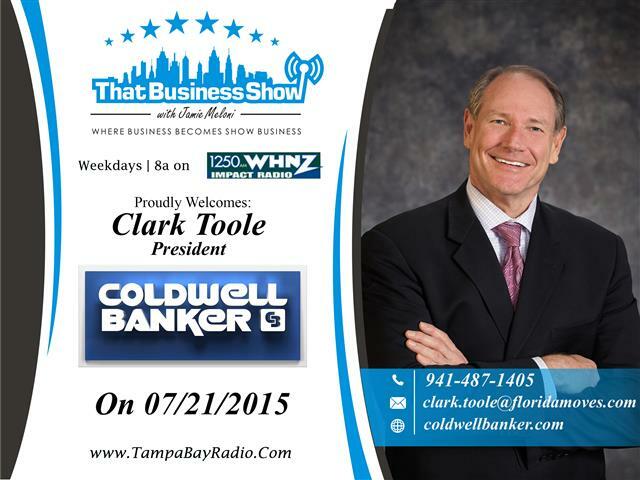 Today on #ThatBusinessShow, I spoke with Coldwell Banker Residential Real Estate Florida President Clark Toole. Clark is a lifelong Real Estate Professional and started selling Real Estate in 1975 to pay his way through Graduate School where he obtained his MBA in Real Estate and Marketing. Clarks pathway to leadership grew from his role as a Realtor into Real Office Branch Management where he guided and trained many sales professionals eventually landing in his current role as State Leader for Coldwell Banker Residential Real Estate. As president of Coldwell Banker Residential Real Estate, Clark Toole oversees the operations of Florida’s largest residential real estate company. With more than 85 offices and 5,100 sales associates, Coldwell Banker closed over $12.7 billion in Florida residential sales in 2014. Clark also acts as president of Coldwell Banker Commercial NRT in Florida, which offers five offices and more than 90 sales associates. Both are headquartered in Sarasota. Clark earned a reputation for strong leadership and foresight during the recent economic downturn, when Florida’s residential and commercial real estate markets took one of the biggest hits in the country. As newspaper headlines focused on gloomy economic forecasts, Clark turned his attention to uncovering niche markets and buyer pools that were still capable of investing in Florida real estate, despite the lagging economy. Clark shares some great stories on this segment including the story of his first home sale back in 1975 through his involvement with the Coldwell Banker acquisition of Arvida, which was the largest Real Estate acquisition in history. Clark also takes us through the changes in the Real Estate marketplace both from a buyer and a seller perspective since his entry into the business in 1975 and also takes about many of the challenges sales professionals face today and how they can work to set themselves apart from competition. This is a great piece on Real Estate and Christina Griffin, fellow top producing Coldwell Banker Real Estate Professional, joined me in the studio as co-host and adds some great commentary to the discussion. As always, you can find the show On Demand on iTunes by searching for That Business Show, and also available On Demand at http://www.tampabayradio.com, both audio and video. Find the show on my YouTube channel as well and keep up to date with all the show happenings at http://www.facebook.com/thatbusinessshow! This entry was posted in Entrepreneurship and Business and tagged bank owned, business, coldwell banker, entrepreneur, foreclosures, gen blue, real estate. Bookmark the permalink.